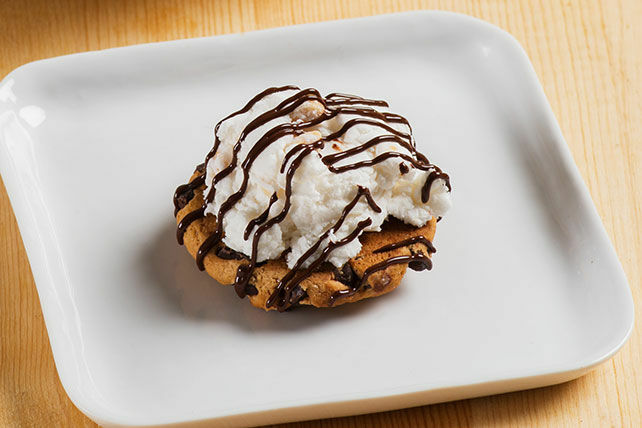 Here's a modified version of a chocolate chip cookie ice cream sandwich. It's sort of like an open-face sandwich—with nuts and yummy chocolate drizzle. Place 1 cookie in each of 12 paper-lined muffin cups. Mix ice cream and nuts until blended; spoon evenly over cookies. Drizzle with melted chocolate. Drizzling chocolate takes only a flick of the wrist. Melt chocolate as directed on package; spoon into freezer-weight resealable plastic bag. Seal bag, then fold down top of bag tightly. Cut small piece off one bottom corner of bag. Hold top of bag firmly and drizzle chocolate through opening in desired pattern. For longer storage, freeze these fun treats until firm, then wrap individually and store in freezer up to 2 weeks before serving.